Photo of the day: Coconut ice cream @ Chatuchak market. Photo credit: Aaron. Don’t worry. I haven’t forgotten about the Chatuchak Market, which I wanted to go to yesterday but instead got distracted by the Tourism Festival (which was an awesome distraction by the way). Aaron needed his morning coffee, so we stopped by Wanderlust again to get some coffee and a light breakfast since it will take at least 45 minutes to get to the market. 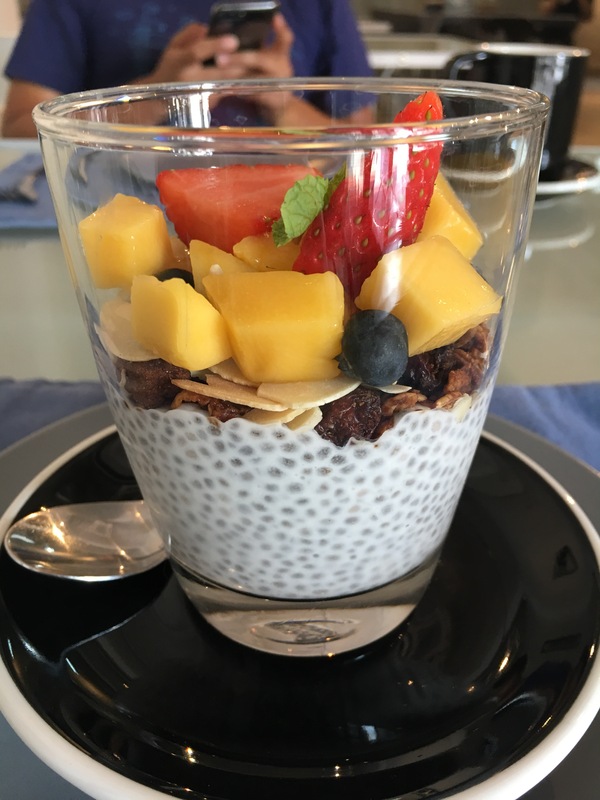 I tried the chia pudding and Aaron had the avocado scramble. Both were very light and healthy, but at the same time very tasty. Then we were off! Taking the subway was very convenient and simple. We just needed to buy a token from the machines by selecting the stop we wanted to get off and that was it. The subway itself looked very clean and had strong AC, so I was wishing I had taken a cardigan with me. The stations were announced and displayed in Thai and English so it wasn’t hard to know when to get off. I read to get off at the Kamphaeng Phet station instead of the Chatuchak Park station, as one would naturally assume. The tips were useful because once we got out of the station, we were straight into the market! Once again, we were happily overwhelmed by the number of stalls here! I was expecting a dirty, crowded market like Ben Thanh but this was so much better. There were even air-conditioned sections of the market and very nice sit down areas. The selection of stalls is not limited to souvenirs and food but also really cute clothing and even pets! It was difficult not to be distracted with everything going on, but I had to focus. I had written up a list of foods I wanted to try and had to get to work! Aaron first wanted to get some coconut juice. It was really good and really sweet so I wonder if they added sugar in there. There were food stalls everywhere but most were dessert type stalls. I wanted something savoury. 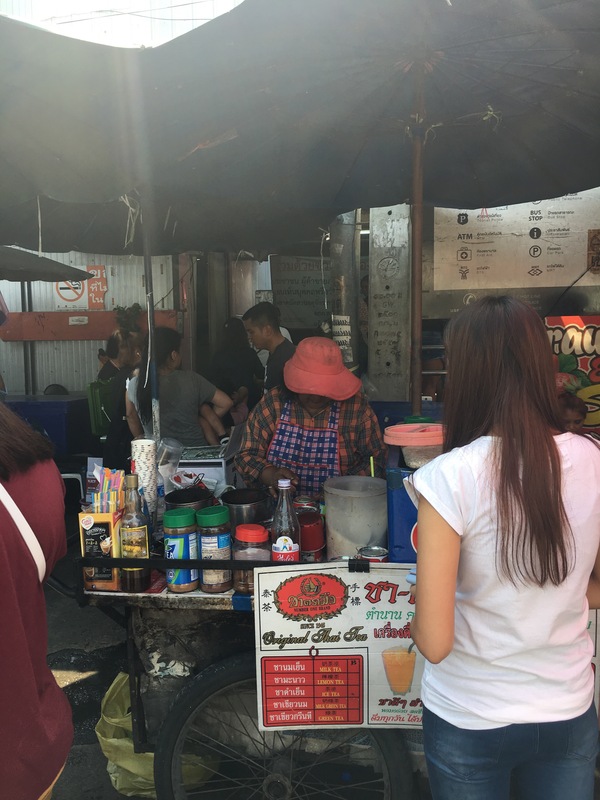 I finally came across a row of food stalls but the thing which caught my attention was the Thai Milk Tea stand. It was a small stall ran by this older woman with no fancy English signs or displays. It was just her and her cans of condensed and evaporated milk. Along with another can used to steep tea. I knew I had to get the tea from her. 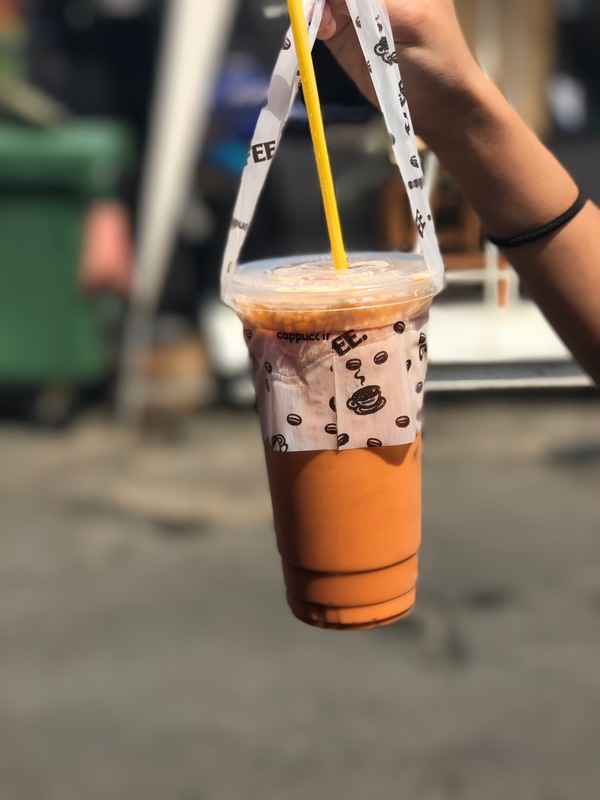 For a total cost of 25 baht (~$1 CAD), I got my first Thai Milk Tea and it was amazing! Sorry Aaron, it was better than the Teh Tarik that we had last night. The tea was rich and it was just the right amount of sweetness, especially as the ice melted. My very first Thai milk tea! Photo credit: Aaron. Next, we reached the store front of the legendary paella restaurant/bar/stall. 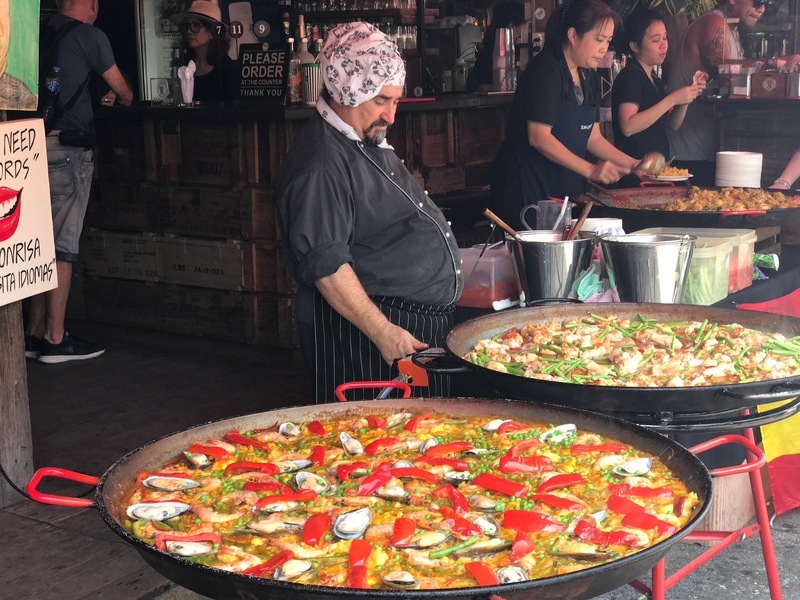 You cannot walk by without staring at the humongous pans of sizzling paella being cooked right in front of you. The colours are amazing with the red peppers, green peas and the orange saffron-infused rice. I know we’re not in Spain, but it is my favourite Spanish dish and it was on my list, so I had to get it. It wasn’t a dirt cheap dish costing 160 baht (~$6 CAD) for a small plate, but it was so worth it. We both one plate to share and took a seat and watched how people would stop, stare, take some photos and decide to order a plate for themselves. It was definitely flavourful and the shrimp was big and fresh. It probably wasn’t as good as the ones I’ve had in Spain but it came pretty close, plus the atmosphere was awesome! The big pans of paella with the chef. Photo credit: Aaron. This market really is the one-stop shop. Bought too much and don’t have enough room to carry it in your bags? Don’t worry! There are shipping companies set up to help you with that. Don’t have enough cash? There are ATMs and exchange kiosks everywhere. Need to use the bathroom? There are pretty well-kept bathrooms facilities at every corner of the market! Tired of walking? There are massage parlours set up every 20 steps you walk! I saw a lot of people carrying around luggages and there were of course stores selling luggages. So I wondered, are these people just purchasing luggages, or did they bring it to carry their purchases, or did they just come from the airport? I think some of these people just came from the airport because I see their airline tags still on it. One of the things on my list is to try the fried quail eggs. There are many stalls so we just picked one and tried it out. I saw her making it and putting it into the styrofoam containers so I thought this was a good stall to get it. We also saw people getting the squid eggs which was still sizzling on the pan so we got a container of that too. 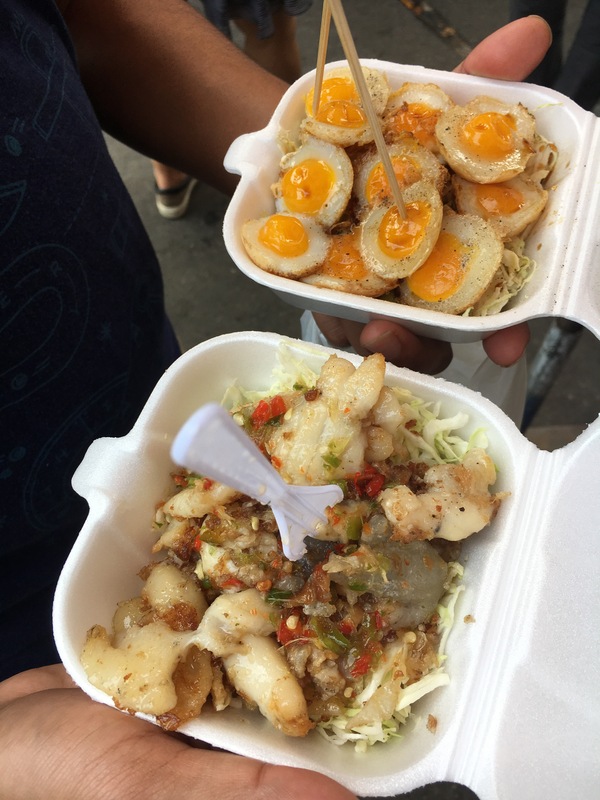 We paid our 100 baht (~$4 CND) and walked away, only to find out the container she gave us of the quail egg was super cold! We walked back to ask for another one and of course she shakes her head and says “finished”. As in I’m finished with you. I took your money and you walked away with a bad box I provided for you and it’s over. I was pretty disappointed about our purchase and didn’t end up eating it and the squid eggs had good flavour but the slimy texture really wasn’t for me. Oh well. At the end of the day, it was only a few dollars but principally, I was not impressed! Lesson learned! We were getting tired, so decided to sit down at a busy sit down open-air restaurant/cafeteria for something more substantial. Aaron had a green curry and I wanted to try their seafood suki (a Thai sukiyaki dish). Aaron noticed that they usually serve their green curries with noodles here instead of rice, like what we’re used to Canada. It was much tastier (and spicier) than the ones we’ve had in Canada though. As if that wasn’t spicy enough, my suki was on fire! It had the sweetness expected from a sukiyaki but I wasn’t expecting the spice. Inside it was mainly squid, some green vegetable and also vermicelli. Even with a bottle of water beside me, it was too much for my taste buds to handle and I couldn’t finish all the vermicelli. It was time to find something to cool my taste buds down. We found a coconut ice cream stall around the corner. (Not hard to find, since they are everywhere!) I asked to have the ice cream with corn and sticky rice as well as the mango and coconut they served it with. This definitely cheered me up from the quail egg incident. I definitely think corn and coconut should get married. This reminds me of Che Bap, a Vietnamese dessert that I never got to have in Vietnam. Aaron really liked the mango and coconut pair. And the addition of the slightly savoury sticky rice was very nice as well. We next came across a mango sticky rice stall, which looked legit. 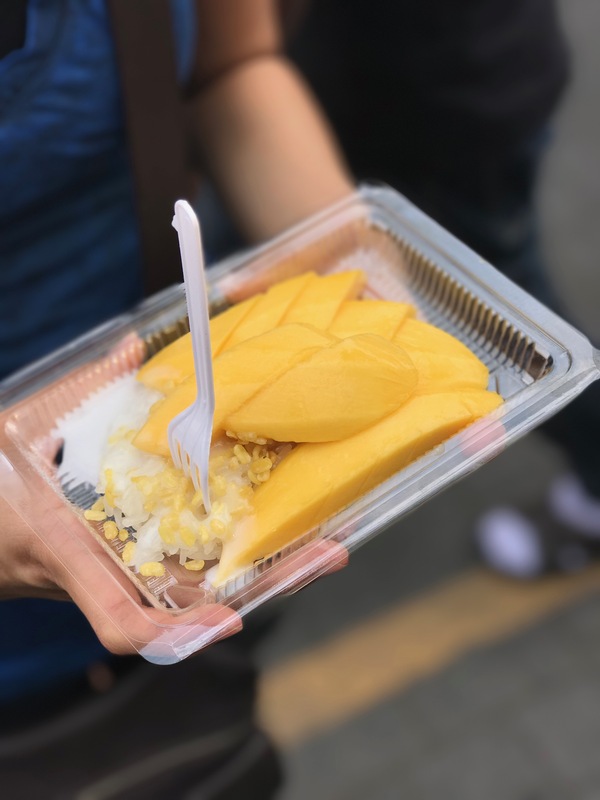 We’ve seen a lot of mango sticky rice sold everywhere but most are selling other items too and did not seem to specialize in this. In addition, a lot of them just had it sitting around in a container. We saw this stall was slicing the mangos and assembling the set right in front of us with the sticky rice, condensed milk and those “Rice Crispies”-looking things. We knew this was the place to get it. I was thinking perhaps it would taste a lot like the coconut ice cream we just had with the same combination of mango and sticky rice but I was wrong. This sticky rice was delicious. It was salted and really added to the whole dish. I again really enjoyed the addition of the “Rice Crispies” as it added texture to the mix. I should really find out what they are called. We were getting really tired from all the walking so we figured it was time to get a foot massage. We tried bargaining but it didn’t work. It seems that the massage places have mutually agreed on a set price of 150 baht for 30 minutes and are not flexible with it at all. It was still only ~$6 CAD so we went for it anyway. We found with AC and make-shift plastic curtains. There were maybe a dozen or so massage chairs set up dim lighting and hardly any space to walk. Most of the patrons seem to really be enjoying their massages and had their eyes closed, perhaps fast asleep? I guess no one really took advantage of their “free-wifi” benefit. It wasn’t long before 2 seats freed up and we sat down. It wasn’t the cleanest of facilities but I was impressed they actually disinfected our feet and legs before the massage. I expected foot massages to be quite painful, but it was quite nice. It was more of a leg massage, which was great since we’ve been walking all day. 30 minutes quickly flew by and the massage was over before we knew it. We figured it was time to head home. 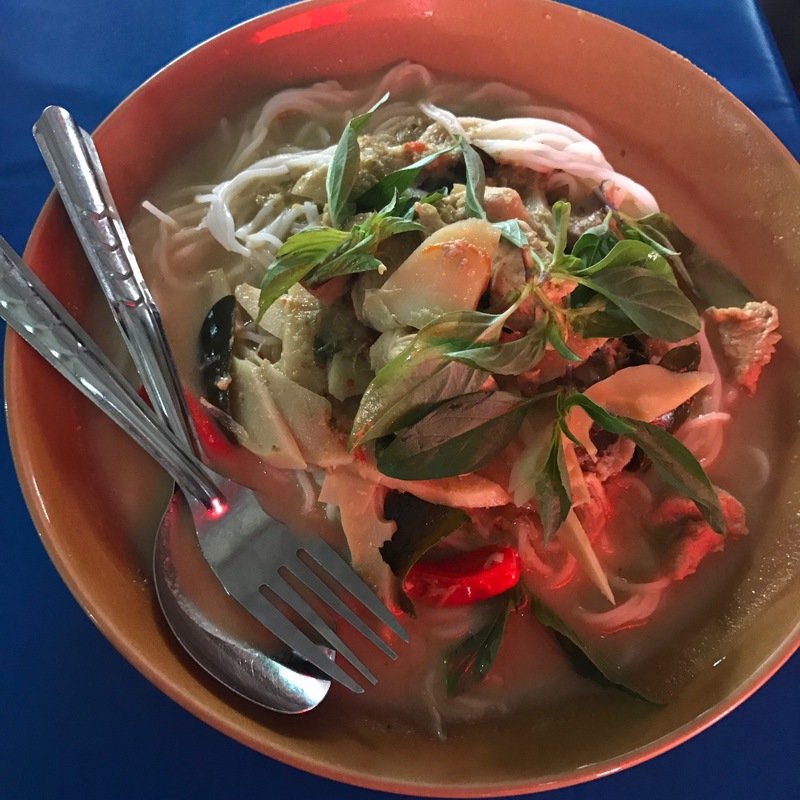 On the way to the subway station, we found Wait For, the stall famous for their chicken noodle, so we decided to walk around some more to work up more of an appetite to consume it. 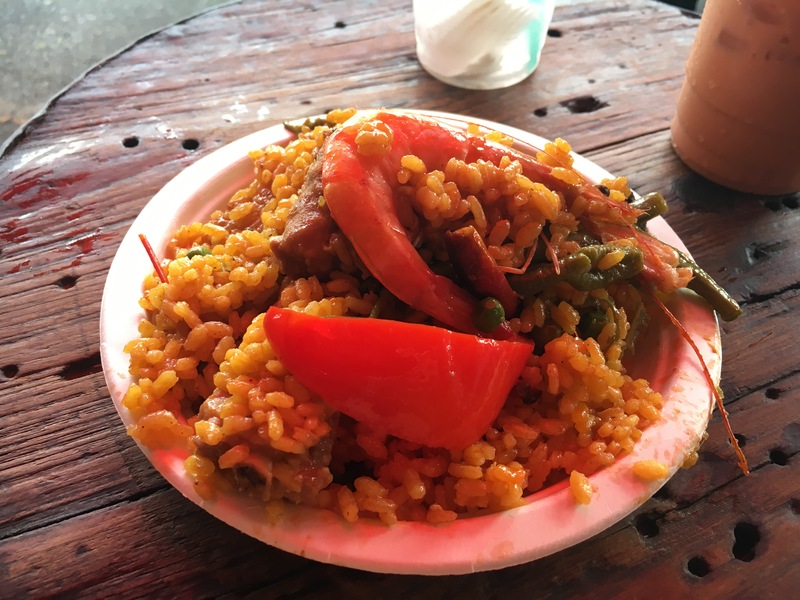 During our walk, we passed by the paella stall again and now they have a DJ playing some awesome beats as well the the chef doing some tricks and tossing some ?cashews to the crowd. Can this place get any more amazing? I was tempted to sit down for a beer just to soak this in but decided I probably can’t fit chicken noodles and a beer in my stomach right now. Instead, I opted for a 5 baht coke popsicle, made by pouring coke into little metal tubes and quickly frozen by shifting of this contraption back and forth. Mind-blowing. For some reason this sweet treat made me really thirsty and I made a mistake by getting another sweet drink. This time the Chrysanthemum juice, which was really, not that good. It was just pure sugar presented in a fluroscent yellow fluid. 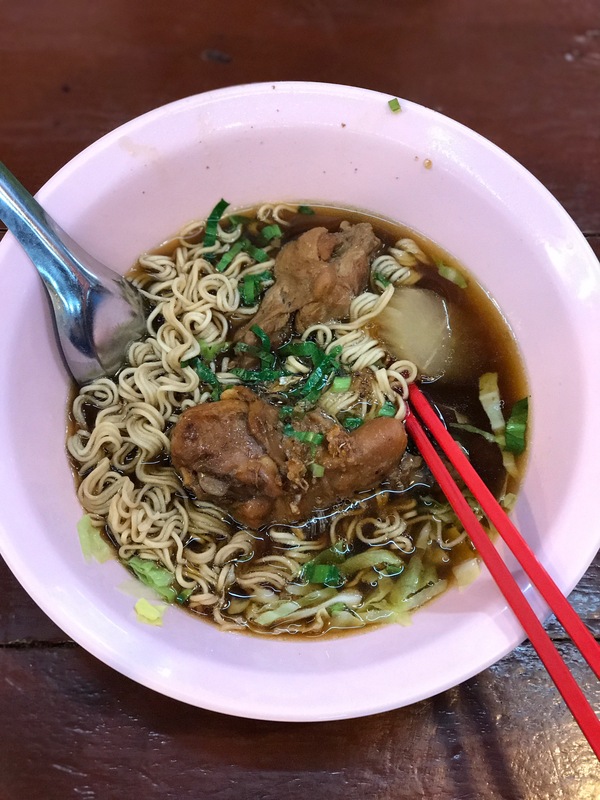 We eventually walked back to Wait For and ordered the Chicken Drumstick with instant noodle combo. It was really tasty and worth the visit. The drumstick was nicely braised/marinated in soy sauce and the broth was very rich and delicious. And how can instant noodles taste bad? What a nice way to end our food feast at the famous JJ Market. Once we got home, we were both so “streetfooded-out”, we decided to just chill at the hotel lounge and enjoyed some drinks along with some live jazz. Of course, no matter how much I eat, I always get hungry again by the next meal time, so we just ordered a few dishes at the lounge/restaurant. This was definitely a more upscale experience but it was just what we needed. 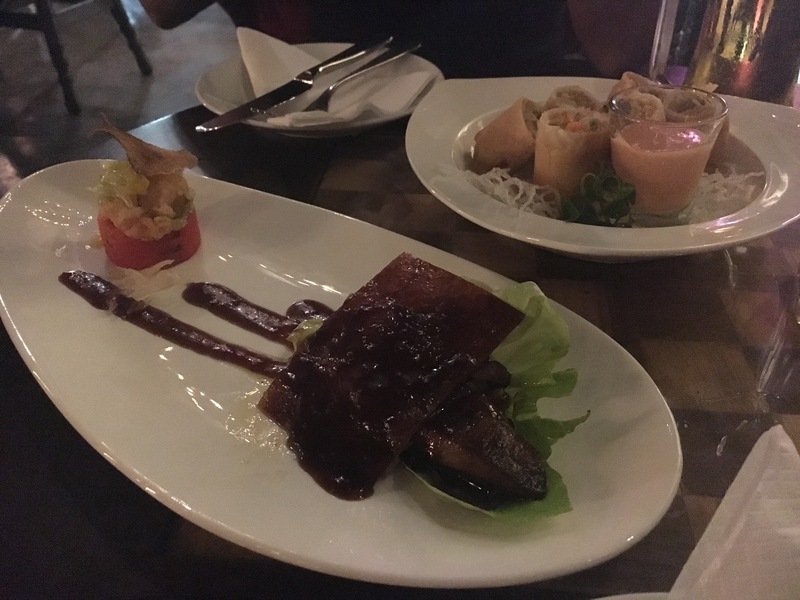 We started with the wasabi shrimp with foie gras served with duck skin, then had some vegetable spring rolls, and ended with the seafood fried rice. I was expecting a mediocre overpriced meal but it was actually quite tasty. The shrimp dish was beautifully presented and the duck skin was very well done. The portion of the foie gras was actually quite generous. 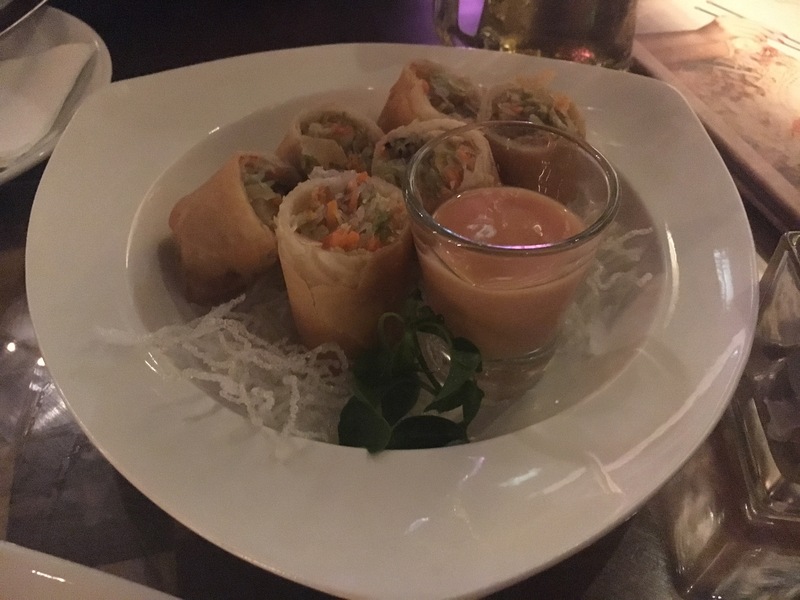 The vegetable spring rolls were also generously filled, but I wasn’t a fan of the plum sauce. 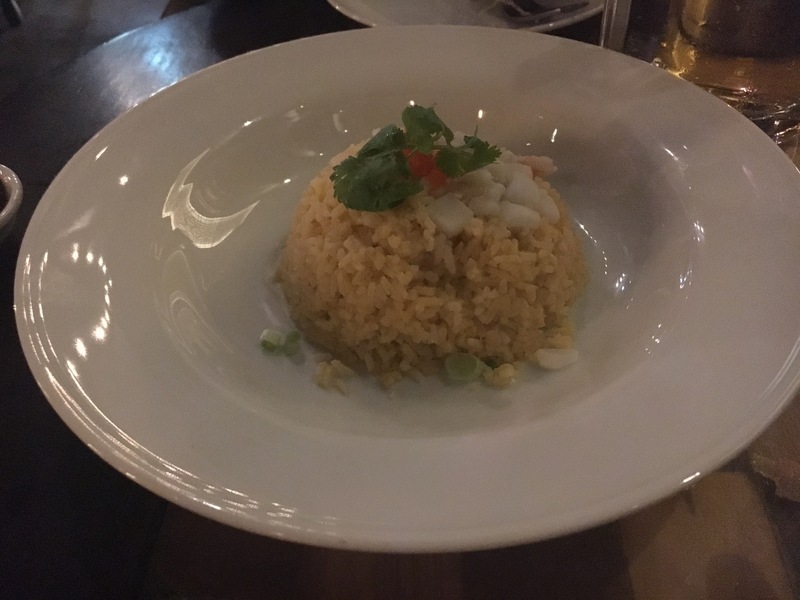 The seafood fried rice was not bad but was mostly rice and not enough other stuff. Aaron was not impressed by the serving size and did not think it filled him up. 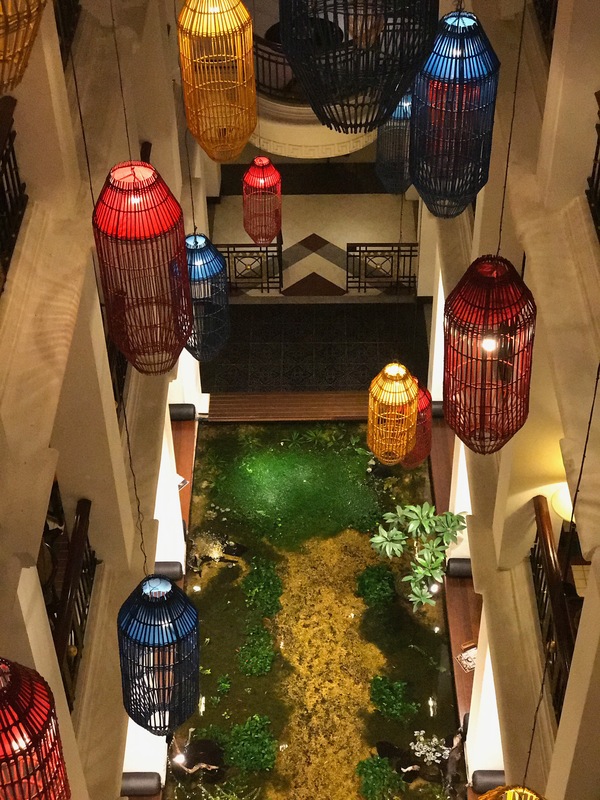 The atrium of our hotel (Shanghai Mansion Bangkok). Photo credit: Aaron. 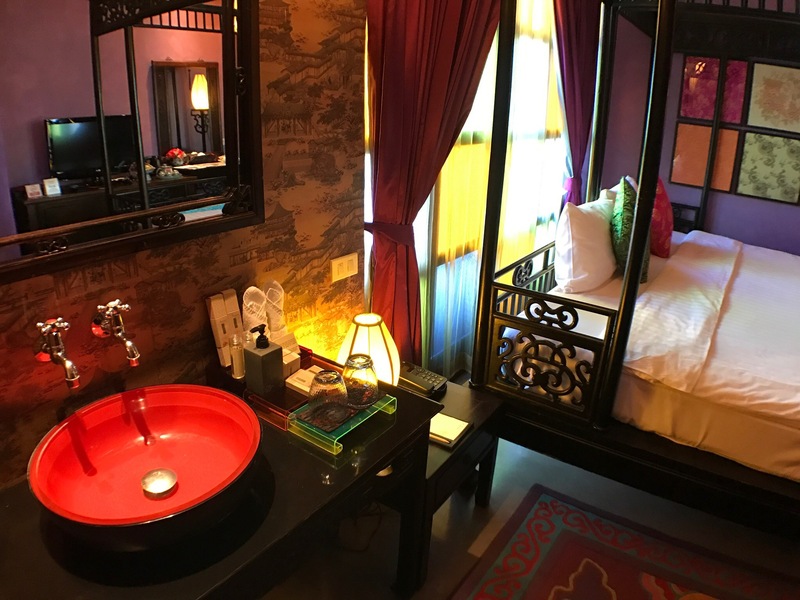 Our room – perfect for Chinese New Year! Photo credit: Aaron. Seafood fried rice @ Red Rose Restaurant.